November 5, 2016 By Tina M 15 Comments This post may contain affiliate links. Read my disclosure policy here. If this is your first time to the blog, you better check out our other busy bag ideas. We got lots of them! This particular busy bag can be printed on card stock, but I recommend laminating with 5mil laminating pouches. If you are going to put together a bunch of busy bags I recommend owning your own laminator, as they are so cheap and much more affordable than having it done at your local copy shop. My son Always scoops up his burger and makes chopping noises as he pretends to gobble it up. 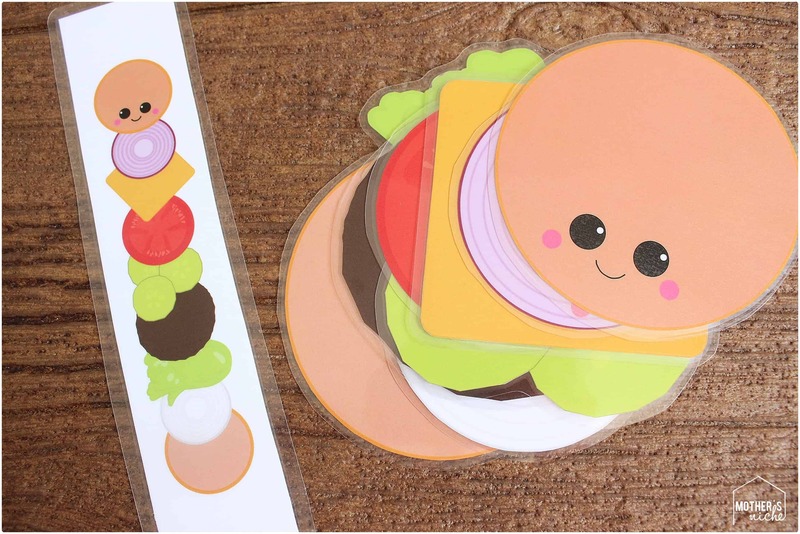 Build a Burger Busy Bag Printables! If you want to get all of the printables you can purchase them here. How do you make each bag to go with? Maybe that’s a silly question. Is it just cut out vinyl? Thx! I bought the little fabric bags and cut out the letters on iron-on /heat transfer sheets using a silhouette machine. The iron on seems to stay really well. It was really fun and not hard at all. Thank you. I love these!!!!!!!!!!! Thanks for this!! One of my daycare children wishes to be a chef when she grows up so this is a fun activity for her! Would love to see more like these. 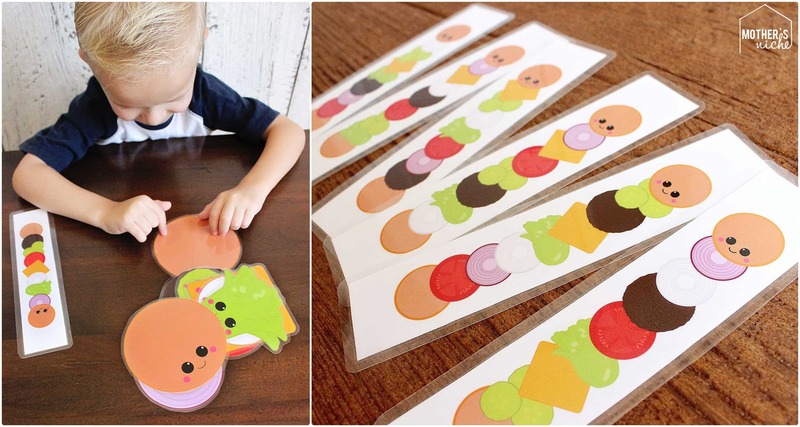 These are so awesome – thank you for sharing all your great ideas 🙂 It’s helping me keep my 5 year old busy at home! Fabulous, my class will love this! It will fit beautifully into two of my themes and continue challenging them to follow a pattern. Thanks for sharing this! Just wondering if I’m doing something wrong?!?! these are SO cute! thank you so much for sharing them! How can I download it for free? I tried to register but it does not leave me … if someone can answer me, I really like the material. Thank you! Hello, where did you find the clipart for these, what artist? I love the burgers and fruit and vegetables and would like to get the same ones for my classroom. Also love your products. HI trying to find the printable for just the burger but there is nothing to click on.